Mr. Randig started his San Bernardino CA nursery in 1918 at 21 years of age. He specialized in growing water lilies and orchids. Starting with tropical water lily species, (particularly colour forms of Nymphaea capensis, var. zanzibariensis), he developed many hybrids which he exhibited in California state and county fairs in the 1930's.He consistently won first prize for the best collection of waterlilies. He won the gold certificate of merit for his display at the San Fransisco's world fair, and Special recognition for new hybrids at the New Yorks World Fair. When the United States entered World War 11, Randig put aside his hybridizing experiments to enter war work. All his tubers were covered with slightly moist sand and stored in sealed metal cans. After the war, he discovered that many of the cans had rusted, allowing mice to chew them open and eat the tubers. 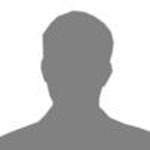 Nevertheless, he resumed his hybridizing starting with the few remaining tubers until after 12 years, he had sufficient plants to introduce them to the public. He asked Ted Uber of Van Ness Water Gardens to utilize a separate page of his catalogue for the new waterliliy introductions. Even after this momentous event, Randig continued his hybridizing and introduced new named varieties. After Randigs death, Mrs Randig invited Ted Uber to select some waterlilies among the remaining stock that showed promise for subsequent introduction. This, Mr Uber did, and after increasing the stock, introduced 5 more hybrids, one of which he named after Mr. Martin Randig. 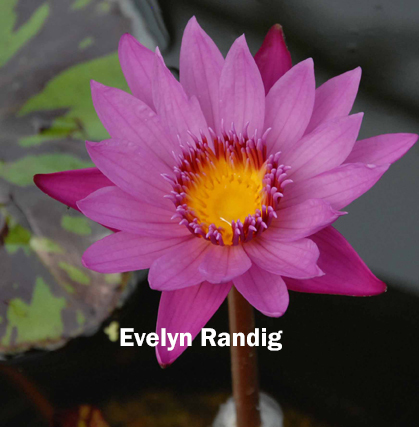 The total number of named waterlily hybrids attributed to Randig is 28. 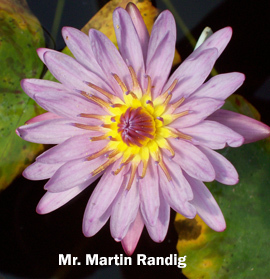 His contribution to water gardening was gratefully acknowledged by Louella Uber in the March1987 Issue of The Water Garden Journal, Van Ness Wter gardens Past, Present and Future "We owe much of our success to my friendship with Mr. Randig. He new introductions with their many shades and colors put Vans Ness Water Gardens on the Map." One of his lilies Evelyn Randig was not named for 10 years until the birth of his daughter Evelyn. Martin Randig was inducted into the Hall of Fame in 1992 at the Houston Texas Symposium. All of us in the society were charmed and delighted by the joyous and enthusiastic manner in which Martin Randig's daughter Evelyn received The Hall of Fame Award for her father.